Many dog owners say “a life without a dog is diminished” though they are not exactly low-maintenance pet. The dog is one of the most satisfying, rewarding and magical things of their life. But there is no dog owner you can find who loves to pick up dog poop after finishing their business. In this case, the right pooper scooper makes the task easy, quick and hands-free. Dog owners are more conscious about the proper management of their pet’s wastes to contribute at the overall cleanliness of the environment. So they need to look for in a poop scooper to get the best one. Generally, pooper scoopers come in various shape and sizes and make the task of picking simple. Some of them come with the bag to clean up dog’s pop quickly without touching any dirty. Here we have reviewed and listed 10 best dog poop scoopers those are dominating market regarding their features, functionality, sturdiness and positive customer reviews. Through this article, we’ll also demonstrate overall benefits and particular drawbacks of this product, so that you can compare and justify it easily. 3 What is a Pooper Scooper? 6 Why is it Essential to Clean up Dogs Poop? 7 How to Buy a Pooper Scooper? Nature’s miracle jaw scoop is one of the top pooper scoopers and we have reviewed this as our #1 pick of the list for its excellent build quality. You can pick up easily your dog’s waste and any kind of related service by this scooper without much trouble because you do not have to be curved to pick the poop. The great feature of this poop scooper is 100% non-stick plastic material. It is water-proof and there is no anxiety about washing or dried out poop after that. It helps to remove dirt from your pet’s coat and paws after walks or before entering the house. The antimicrobial product protection keeps your pet clean and fresh for a long time. There are two sizes of Nature’s miracle poop scooper- medium and large. The Medium size is absolute for small dogs and the Jumbo size is for large dogs. It is lightweight and very easy to use. It comes with uncompromising quality in the lower price range. Nature’s miracle jaw scoop is most popular for its durability, functionality, sturdiness and all other special features. It is very much effective for outdoor using. There are thousands of customer provide their positive reviews after using this product which makes it more trustworthy. So, collect this scooper for a clean home and a happy, healthy pet. 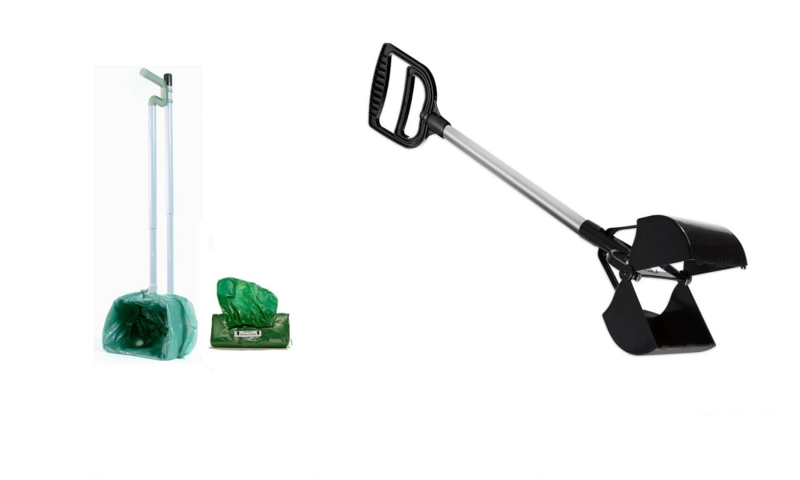 Grass Wire Rake Scooper is our second selection on this list specially designed for easy pet clean-ups in grassy or sandy areas. It is mainly for grass and definitely ideal for large dogs during moves on grass or sands. This dog poop rake scooper is simple in design and you will feel like gardening work while using. The spaced metal prongs allow easy and quick passage through sand or grass. It is made of sturdy and durable materials offer excellent facilitates for a comfortable rubber grip. It can easily pick up a total waste of your dog and make your everyday job of picking dog sanitary much easier. You can buy a set of poop scooper rake but sometimes they are not available in high demand. The best advantage of this product is “rust-resistant capacity” and you can always move it at outside even in icy or rainy weather without any trouble. It is most suitable to use in the yard to keep it clean and healthy. Finally, this product is an easy and relaxed item for everybody who feels to clean pet waste on the regular basis. Petmate Clean is a large capacity swivel bin made for the special purpose to simplify all aspects of picking up pet waste. The scooper size is designed for huge pickup ability through any surface to eliminate mess and maximize comfort and control. Its assembly is very simple and saves your time due to quick unloading facility. The handle is made of very hard plastic. Comparing with other brands it is much sturdy and has nice bigger plastic grocery bags for easy cleanup. 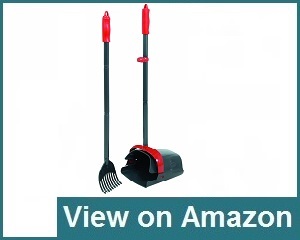 It is a durable, rotating poop scooper made with a combination between regular pet scooper rakes with panes and spades. It works better for places where it is very easy to sweep but does not work properly at in concrete or tall grass. The plastic rake is dedicated for the effective pick-ups on a variety of surfaces including grass, dirt, and pavement. The ergonomic design helps to eliminate leg and back fatigue and strain. The convenient handle is taller than 3 feet which provides a soft and comfortable grip. You can also use hygienic clean-up plastic grocery bags to the bucket. It is comfortable for pet parents and works well for clean-up the bag and the bucket. Poop Patrol Jaw is another selected Pooper Scooper made by the famous dog product manufacturing company Noz2Noz, and it will make your job easier than other dog poop scooper due to its structural convenience. This pop patrol jaw scoop is made of a very lightweight plastic material which is easy to wash and clean up. It provides more convenient to pick up your dog’s poop for 1-handed spring action. It also facilitates to pick up from long grass, concrete, cement, dirt and so on. The pooper scoop is 27 inches in length to stop any unnecessary bending. Top paw jaws scooper is designed with long-lasting high quality and heavy-duty materials to ensure its longevity. It is absolute for backyard clean-up and its comfortable finger grips make it easy to use. Many dog proprietors admire this dog scooper for its sturdiness and quick cleaning facilities. After all, it’s an item of excellence provides all quality features with decent price. Dogit Jawz Waste Scoop is special for the small dogs, possible to handle with one hand to pick up wastes. It is one of the genuine and cheapest dog pooper scooper make easy to poop up from the grass, dirt, and pavement. Without bending yourself you can pick up poop from grass, when traveling or gaming at the park. This pop scooper is designed ergonomically and its prominent teeth help to pick up wastes properly from grass or zigzag surfaces. That is why it is considered as perfect for outdoor activities. The spring-loaded feature of this scooper allows quick waste collection through one hand in one simple motion and drop into the poop bag by the other hand. 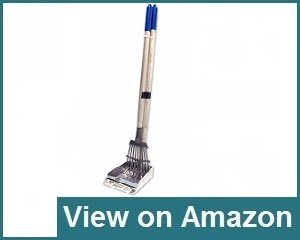 The scooper is 25.5 inches long and provides an excellent service both for a smooth and concrete surface. 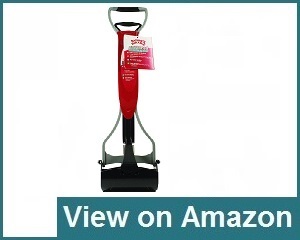 Nature’s Miracle 2-in-1 Rake and Spade is a great tool works on concrete, smooth surface and even on grass. 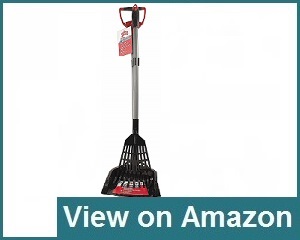 It is easy to switch between a rake and a spade on various surfaces for easy waste cleanup. There is no spring attached with this scooper and no chance to break anything so that you can use it longer than any other. It is simple in design but structurally enough strong, that’s why dog owners consider it as the most solid dog poop scooper in the market. It also comes with antimicrobial protection as well. Panorama Dog Scoop and Rake is an ideal set for large dog breeds. 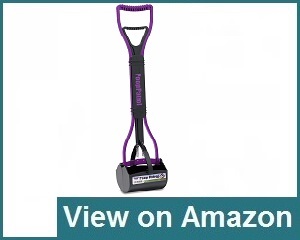 It is designed by a 3-inch aluminum handle with comfortable rubber grip which makes it an excellent dog scooper to use in the backyard for outdoor activities. Dog owners like it very much for being used at grass, carpet and zigzag surfaces. The teeth of this rake are sturdy can tolerate more pressure to collect dog’s pop. It has nonslip molded vinyl grips pick up, which is formulated by long-lasting supreme ingredients for long-lasting use. Moreover, this scooper and rake sets are also made with all attractive fun colors that you like most. The complete sanitary waste cleaning package made with sturdy frame and dual springs which make the cleaning process much easier. All premium grade non-plastic, lightweight materials are used to make this scooper. This poop scooper includes a cute dog bone shape bag and you can set the bag on the shovel ends to make the cleaning process better and faster. 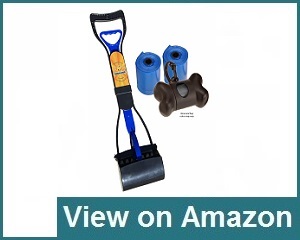 A bonus refill roll bag also attached with this dog scoop and makes it perfect for small and large dogs to clean up wastes from the gravel, grass, dirt and other surfaces. The manufacturing company ensures 100% money back guarantee for any error of this product and we hope you will enjoy a peaceful tour with your pooch in the presence of this device. Spotty metal is a cheaper, durable, aluminum pet poop scooper perfect for large dogs to clean up yards or outdoors. There is no assembly is needed for these poop scooper, that’s why it is fast and easy to maintain. The used metal rake and pan snap remain together for easy storage. You can move with it for any climate including direct sunlight or rain for everyday use. It has long handle diminish bending and make this set more flexible to use. Due to lightweight, it is easy to carry out for outdoor using and more convenient to store. It looks well-made during the last couple of years. 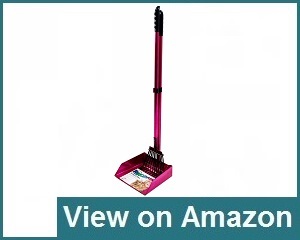 Petmaker Duty Shovel is a heavy duty dog poop scooper compared to other quality scoopers. 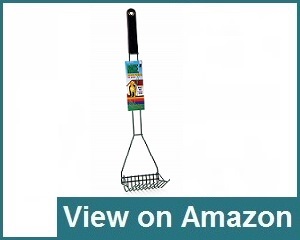 It is designed with a combination of heavy duty pan and one-handed handles jaw scoops. 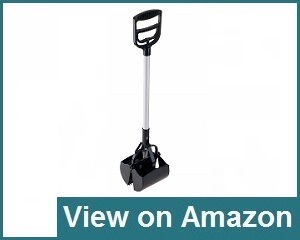 The handle offers spring action and makes it easy to pick up wastes from long grass or flat surfaces. Here the basic materials are plastic and aluminum. It is cheaper in price and appropriate for any dog size. Otherwise, PET MAKER Jumbo is an ergonomic poop scooper helps to cut down dogs pop without bending or kneeling. Overall, this heavy duty product is great for picking up dog poop from any surface. Finally, many pet proprietors choose this heavy duty scooper as the ultimate dog waste cleaner. It is a device, used to pick up animal waste and clean up our surroundings. In the beginning, the design comes with a metal bin including the rake-like edge. Sometimes, a poop bag is attached inside the scooper to carry the feces through a proper disposal area. There are various types of pooper scoopers are available in the market and they are very useful to clean up dog’s poop. But few of them are special for their distinct feature and quality. These scoopers feature all-in-one assortments like jaw-type models and can be easily operated by one hand. It is portable and very convenient to carry for outdoor using. Since the model is single-handed, you can use the other hand to handle your dog. This type of pooper scoopers is less effective to contact with dog’s poop. They come with tongs, which help to make easier scooping at any surface and more convenient to use. This scoop type offers an untidy way to clean up dog wastes but you may use more hands-on to clear up the mess if the waste does not scoop up easily. It lasts longer even after extensive use. These type scoopers are designed with a long handle and avoid the need to bend down during scooping the dog’s waste. They bring great opportunity for pet owners who struggle to bend down; therefore most of them like to have this poop scooper to use at home. There are so many reasons to buy a dog poop scooper. Here we will discuss most of the important reasons in greater details to make you the right decision. When a pet drops wastes on your courtyard, instantaneously eggs of roundworms and certain other parasites spread into the soil. Then, when your baby walks barefoot over the same area, those eggs can be transferred into his or her body. If the dog is infected, there is more possibility to carry and spread the variety of disease including hookworms, ringworms, and tapeworms. These microorganisms are very much harmful to the human body and may cause of fever, headache, diarrhea or similar diseases. There are almost 23 million bacteria includes with a single gram of dog’s poop. These can live in the soil for a long time period and can easily transmit to both human and animal’s body. Bacteria from dog waste can spread through the water stream and enhance a huge amount of nitrogen to water may cause necessary oxygen deficiency for grasses, fishes, and wildlife. The snow and rainfall also melt dog waste and flows downstream across open fields, parks or lake. It creates serious water pollution and destroys the quality of water level which threatens the aquatic animals for the living. Remember, pet waste does not make good fertilizer as like cow dung. It spreads stinks malodor and creates toxic to your lawn causes dead spots and yellow stains. In that case, you should take a quick step to eliminate the canine dropping and save the lawn. You need to be more responsible at this time against your dog’s actions. Unless the dog properly trained up to pass stool in the perfect place, you have to clean up the mess to keep your yard fresh and safe. Every pet proprietor including urban or suburban area is covered by the law of cleaning up their canine dropping. It also includes a public and personal area which is openly used. As a dog owner, you have no opportunity to avoid the law and it is also your moral duty to clean up the dog waste and make sure the place safe for your pets and children. For more wariness, some special signs posted on the particular places that mention dog owners have to clean up their pets poop. For refusing to clean up the waste, anyone can call through a phone number against the pet owner to take the legal action. Why is it Essential to Clean up Dogs Poop? There are so many logical explanations for using a dog pooper scooper. Here, is a brief discussion to demonstrate the importance of a canine poop scoop in the following section. Dangerous toxic bacteria and other microorganisms seep into the ground and continue their journey for weeks, months or year after year. These bacteria transmit into human and animals body when contact with the land or contaminated soil. Actually, harmful organisms left on the ground during the rain shower and pollute drains, lakes and our water resources. There is no technology included in filtering wastewater to eliminate bacteria and other pathogenic microorganisms those grow from dog’s poop. That’s why microbe can be spread over lakes, streams, rivers and even in local water utility system. Polluted water may destroy natural habitats of fish and other underwater plants and animals. Even it is not safe to swim in this contaminated water both for human and animals. There is no frequent check to identify the bacterial microbes present in the water simply make the risk. We know when water sources contaminated with germs, all living things are badly affected by it. At that time fishing in these waters can have a bad impact on us. Since microorganisms are inadvertently ingested so we are not sure how much the effect on their overall health. There is a huge possibility to transfer germs from their body to us through eating. Some dogs are used to eat poop enhance the possibility to get affected in the same way. There are various harmful bacteria presents in our dog’s poop and may cause of dangerous diseases for both dog and their owners. Here is a possible list of microorganisms these canine droppings carry. It is our responsibility to look after our pet’s good health and provide them a healthy environment for living. A pooper scooper helps us to reduce spreading all the germs infection around us. How to Buy a Pooper Scooper? An ideal pet poop scooper allows you to pick up and transfer your dog waste easily into the dog poop’s bag. Choosing a quality poop scooper is not mysterious; you should just follow the functionality, structure, sturdiness, reliability, and essentiality of this scooper. Among various pooper scooper, you will select one is the best for you regarding your basic necessities. Some of them contain spring action and others assembled for manually using. Before purchasing, you should make sure that the product is enough lightweight to carry out. In every time, you may require to bring this device when will move with your dog. Normally most of this device made with lightweight materials but some are lighter than other scoopers. Nowadays, most of the owners converted their habit into using poop scoopers and they never want to come back to their old practice because a quality scoopers make their life easy. There are so many poop scoopers available in the market with different type and functionality. To find out the best one, consider your dog type and try to follow at list four factors we have discussed below. A pooper scooper should be sturdy and highly durable for years of use. Usually, high-quality construction consists of aluminum and industrial strength plastics for long lasting. So, before purchasing you should examine the used materials by which the product is made of. Moreover, an ergonomic design is also helpful for people of all sizes and heights to apply the easy action. Along with sturdy and durable construction, a popper scooper should be lightweight for easy carrying at anywhere your pooch pooped. Remember that most cases lightweight means a significant reduction in the durability and strength of the used material. So, ensure the structure of a scooper that is durable but lightweight, easy and convenient to carry and use. Size is another essential factor and most of the time it should be small sizes in terms of storage and portability. Small sized poop scoopers consume less space and make it easy to carry for outdoor using. Large scoopers designated for large dogs or more than one dogs, if you want to handle all of their mess without having multiple trips. All poop scoopers are not ergonomically designed and not easy to use regularly. It may cause of back pain for bending the body haphazardly while picking up poop. So, make sure the selection which can be simple for you to operate. Ideal scoopers can pick up both soft and hard waste from all types of surfaces and it does not get dirty after use. It is easy to carry for outdoor using, clean up and maintenance for further use. Check the construction: observe the design and used ingredients to make sure comfortable use, restore and long-lasting facility. A lower construction quality can break down any time and fall you in a very messy situation. Select place: Think about the place where you are going to use the scooper. If the area covers only the yard or lawn, then portability won’t matter much. But if you decide to carry it for outdoor using, you should definitely choose a portable model. Think about good posture: Some pet proprietors have back injury and difficult to bend down. They should choose the model which allows them to keep completely straight while cleaning up the dog’s mess. Cleaning up after your dog is the legal duty whether someone is watching or not. Canine dropping also causes of environmental and water pollution. So it is the basic courtesy when your pooch poops in the public places like parks and playgrounds. There are various pet scoopers available in the market, offer different facilities and you can choose the best one regarding your need. Some of them are lightweight and portable provide you the facility to carry for outdoor using. Question: What is the pooper scooper used to do? Answer: A pooper scooper is a device to collect animal’s feces from outdoor like public places, yards, or long grass. Poop scoop is specially made for dogs and often it contains particular bags known as Poop bags are like as simple bags turned inside out to bring all the dog poops to an absolute disposal area. Question: What is the significance of using dog poop scooper? Answer: A study has found that in the United States about 83 million dogs generate more than 10 tons of poops every year. You certainly know that Dog poop contains different parasites, harmful bacteria and viruses may cause air and water pollution. So it is your moral duty to clean up your dog’s pop immediately to keep your surroundings pollution free. Most of the dog owners feel disgusting to clean up their pet waste but if you are liable to pick up after your dog business, you can collect one of the great dog scoopers with bags to avoid the regular annoyance of cleaning up your dog’s pop. Question: Is it possible to use same poop scooper for all surfaces? Answer: Actually, there are various scoopers on the market special for using different surfaces to get the best output. Some are suitable for use on the wide range of surface including grass or concrete and some are on other surfaces. We recommend buying a good model which is perfect to be picking up dog waste on a range of surfaces. Question: Are pooper scoopers eco-friendly? Answer: A poop scooper helps us to clean our surroundings from harmful microorganisms. Some pet proprietors use plastic bags to pick up dog mess and leave straight into a trashcan after use. So, using a poop scoop is always healthy and helpful for the environment. Question: Is it easy to clean a dog poop scooper? Answer: Usually, poop scoopers can get messy with regular use but always you should make it clean and germ-free. It is easy to clean a scooper with a quick dip into hot, soapy water and wipe down a dedicated rag. Some models come with dustpan part including a bag for easy cleanup. What¦s Taking place i am new to this, I stumbled upon this I’ve found It absolutely helpful and it has aided me out loads. I am hoping to contribute & help other users like its aided me. Great job. Hey, you had provided very informative details regarding best dog poop scoopers. Thanks for letting us know these helpful information by such post. Keep posting.